Late in 2018, the Whallonsburg Grange Hall purchased the long-disused Whitcomb’s Garage building on Route 22, across the road from the Grange. Our goal is to renovate the building, preserving the historic façade, and to make it available for use by one or more small businesses. We are especially interested in partnering with people who will contribute time and energy to the restoration work. Rent is negotiable, and will be reasonable; the Grange needs to cover the costs of maintaining the building (including property taxes, insurance, utilities, etc.). There are two or possibly three workspaces, depending on how the building is configured, and it has the potential for a small retail space with high visibility at the front. The workshop bays measure (1) 37' x 37'; (2) 25' x 28'; and (3) 29' x 49'; the shop/apartment area is 22' x 37'. The Grange Hall committee overseeing the project will review statements of intent at its next meeting on Thursday, April 4. Anyone interested is invited to submit an initial one-page outline of their business plan or project for consideration at that meeting. For more information or to tour the building contact Andy Buchanan, admin@thegrangehall.info, 518-963-7777. Clean Out the Garage! volunteer work days will take place, Saturday, April 13 and Sunday, April 14. Many hands are needed to begin the renovations, and jobs for all ages, skill levels, and physical ability will be available. Everyone is welcome to come and help as we start the project to turn this unused and deteriorating building into a new community asset. To find out more or to volunteer contact Audie Sparre at the Grange: 518-963-7777 or admin@thegrangehall.info. Big News! The Grange has purchased Whitcomb’s Garage. Grange referendum passes with 78% of the vote! The referendum supporting a new agreement between the Grange and the Town of Essex was passed in the November 6 election. Volunteers canvassed nearly every house in the town and sent out flyers explaining why the Grange and the town should continue to work together now and in the future. The Town of Essex owns the building and the Whallonsburg Grange Hall (a 501c3 nonprofit) manages it on behalf of the Town. The Grange has been responsible for raising over $275,000 and organizing hundreds of hours of volunteer help to rebuild and restore the Grange as a center of the community. The Town will continue its valuable role as a partner in this effort and will continue to pay some of the utilities (up to $4,000) and provide basic services that it does for all other town-owned buildings. Out of the 290 people who voted on the referendum, 78% voted YES! We are grateful to ALL of the people of the Town of Essex, however they voted, who support the Grange through their tax dollars and as volunteers and contributors over the past ten years. And we thank each and every person, wherever you live, who has been a part of this crazy, grand dream to bring back the Grange as a place to gather with friends and neighbors, old and new. Mountain Lakes PBS visited with Essex artist Mac MacDevitt, creator of the My Lai Memorial Exhibit. Mac talks about why he created it and the impact of the massacre. Click on the image below to watch. WHALLONSBURG — If you missed Michael Glabicki and Dirk Miller the first time at the Whallonsburg Grange Hall, Friday's performance is an encore for the duo of Rusted Root fame. “I'm working on a new album for my solo project called MG Uprooted,” said Glabicki, frontman. "Awesome" is how Glabicki describes playing more intimate venues. Pittsburgh is home to both Miller and Glabicki, so they record and rehearse at the latter's home studio. In 2006, the Town of Essex acquired the dilapidated Grange Hall for the sum of one dollar. Two years later in 2008, the town contracted with the Whallonsburg Civic Association, recently reincorporated as the Whallonsburg Grange Hall, to manage the Hall. Through a Memorandum of Understanding it charged the Civic Association with renovating the building, including raising the funds to do so and with managing it as a community center where people throughout the region could attend concerts, films, plays, lectures, and community events, as well as rent the Hall for modest fees. The Town of Essex agreed to support the Grange by covering heating and lighting costs and by providing occasional services such as plowing the parking lot – the same services it provides to all other town-owned properties. Ten years later, we are proud to report that we have fulfilled our responsibilities – and so much more! Upstairs: Removed the drop ceiling and restored the main hall to its original glory; rebuilt the entrance hall and office area; installed two new restrooms; remodeled the balcony and installed safety railings; installed an emergency generator required for a Red Cross emergency shelter; installed acoustic panels to improve sound quality; replaced the uncomfortable wood seats with modern, upholstered chairs; purchased an HD projector, professional movie screen, and digital audio system; installed professional concert speakers and a soundboard; restored the historic painted stage curtain; renovated the stage, including state-of-the-art blackout curtains and theater lighting. Downstairs: Rebuilt the kitchen and purchased equipment to meet Department of Health standards for certified commercial use; remodeled the space to create a multi-use community room and dining hall; installed a new restroom; painted the space; and installed a photo exhibit celebrating the history of the Grange, Whallonsburg and Essex. General: Installed a new septic system; drilled a well; installed a modern water filtration system; rewired the building to code; purchased a security and fire alarm system; and installed energy-efficient air conditioners that also supplement the furnace to reduce energy consumption. Exterior: Added a new standing-seam metal roof and repaired the slate roof; rebuilt the porch; purchased new exterior lighting; repainted the exterior of the building; installed a marque; landscaped the property; and installed exterior signage about the Grange and local agriculture. Community Services: During Hurricane Irene local residents used the Grange as a shelter. After this experience a dedicated group of volunteers were trained by the Red Cross to operate the Grange as an official Red Cross Emergency Shelter. Fundraising for our community: Grange volunteers raised and distributed $38,000 for Whallonsburg neighbors affected by Irene. We have provided space and support for fundraising benefits, including for the Staats family, Reber Rock Farm, and others. The Grange raises money every year at Christmas for the food banks in Willsboro, Westport, and Elizabethtown -- $1,200 last year. The Grange Volunteer Firefighters/EMT Appreciation Days showcase the work and equipment of the Essex, Whallonsburg, and Wadhams VFDs and raise funds for them. 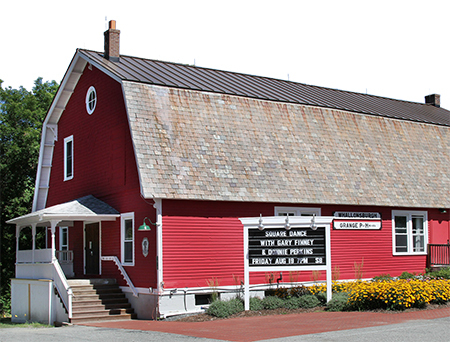 Community events: The Boquet River Theater Festival children’s summer camp uses the Grange for one month every summer and presents sold-out shows every year. Hundreds of children have participated in this theater camp over the past ten years. Other community events include the weekly winter Play Gyms for families with young children, candidates’ nights and annual Election Night Dinners. Community space: Families can rent the Grange for weddings, birthday parties, family reunions, and anniversaries for modest rates. We provide an affordable space for many local groups and organizations including Champlain Area Trails, the Garden Club, Cornell Cooperative Extension. We host classes and workshops for farmers and programs to discuss agricultural issues that affect the community. The Grange has partnered with Mountain Lakes PBS to hold programs where military veterans can meet and discuss their experiences. The certified commercial kitchen is a low-cost facility for value-added food production and catering of events. Education and Entertainment: The Grange has become a cultural center for the entire region. Our well-attended programs improve the quality of life for the entire community, year-round and seasonal residents. Over the last ten years, we have put on hundreds of high-quality concerts, dances, movies, and plays, too many to list. The Lyceum lecture series has presented dozens of educational programs and has a well-deserved reputation for the quality of its speakers. We also help publicize the town of Essex and the Champlain Valley as a destination through social media, event posters, e-newsletters, press releases, and other marketing efforts. A Community-Based Organization: The Whallonsburg Grange Hall is a 501(c)(3) nonprofit organization with a dedicated volunteer board. Grange events are run by volunteers, who set up chairs, take tickets, run the soundboard and lighting, bake and sell refreshments, and do all the necessary behind-the-scenes work. Most of the renovation work was carried out by volunteer crews, including local contractors who donated their time. Support from the Town: The Town of Essex makes an important contribution to the success of the Grange by paying for the heating and electric, and providing some other services. In addition the Town installed a new furnace to replace the 1950s era unit. The Grange has improved the energy efficiency of the building and we also now pay for the phone, insurance, propane, internet and building maintenance. The Town’s support remains essential. The Grange operating budget is very tight and we rely on our successful partnership with the Town. Over the last three years the Town of Essex has paid around $4,000 per year on utilities. This is one-half of one percent (0.5%) of the Town budget, a small price for so many benefits to the community. The WGH Board recognizes and appreciates the ongoing support of the Town for this extraordinary project. We hope that the Town Board continues to see it as a sound and affordable investment in maintaining and improving the community, now and in the future. One of the highlights of the year at the Grange is the arrival in July of several dozen young actors enrolled in the Boquet River Theatre Festival's summer camp. They move into the Grange for four weeks and put on multiple (usually sold-out) performances of two musicals, one by the Junior group (ages 8-12) and the other by the Seniors (ages 13-17). The Depot Theater and BRTF just announced that the Depot will be taking over and ensuring the future of this wonderful program and the Grange will remain "home" for the rehearsals and productions. We are so proud to have hosted and supported BRTF for so many years and look forward to working with the Depot. Bravo to Gigi Mason and the BRTF Board for their dedication and hard work! CLICK HERE to read the Plattsburgh Press-Republican story. The cast in the August 2018 BRTF production of Madagascar on stage at the Grange. 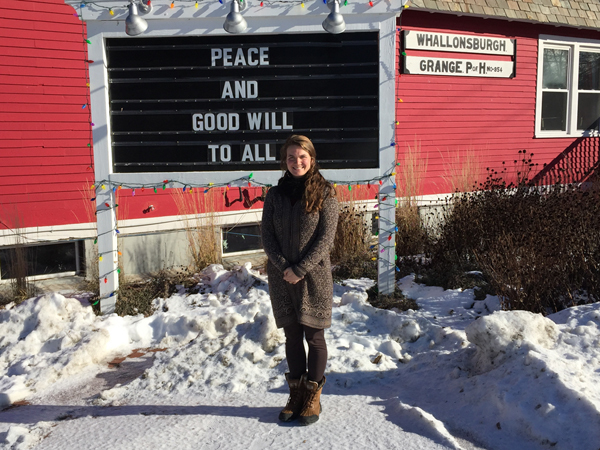 A very Happy New Year and a warm Whallonsburg welcome! After an extensive search we are pleased to have hired Emma Gibbs as our full-time Manager. Emma grew up in Westport and moved back there this year after living and working for eight years in Alaska and Vermont as a youth advocate and social worker. She and her husband, Matt, started Ledge Hill Brewing Company and Emma has also been working as a consultant for marketing and publicity with several Westport organizations. Like many local residents, Emma has memories of the Grange from her childhood and is looking forward to bringing more activities for children and young people here. (She has two of her own who will help her with that!) Emma has great ideas for programs and looks forward to collaborating with other groups on projects and events. She will start her new position in mid-January. The Grange is thrilled to bring Emma Gibbs on board as we start a new year full of exciting opportunities! I spent some time in the New York State Historic Newspapers database looking for evidence of community holiday celebrations at the Grange. The NYSHN is a great place to get lost in the past, easy to search and hard to stop! 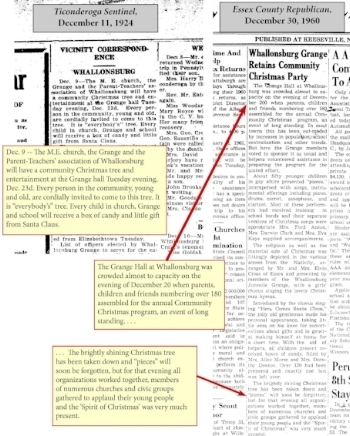 Newspapers like the Essex County Republican, Ticonderoga Sentinel, Lake Placid News and others included short announcements, reports, and references to Christmas celebrations at the Grange starting in 1916 right through the mid-1990s. The Grange chapter hosted holiday pageants and recitations, dances, musical performances, and always had a tree with presents for every child in Whallonsburg. There are still folks around who grew up here and remember Santa's visits to the Christmas parties. These were community-wide events with churches, schools, civic groups and the Fire Department joining in. Recent holiday celebrations have continued that tradition and help us raise money for our neighbors in need through donations to the food pantries in Elizabethtown, Westport, and Willsboro. They are still a nice way to slow down, gather together, and enjoy time with friends. I hope you can join us on Sunday, December 10 for A Christmas Carol and on Saturday, December 16 for the Holiday Market. See you at the Grange this holiday season. CLICK HERE to see a larger and more readable version. The Whallonsburg Grange Hall, a nonprofit, performing arts and community center near Essex, New York, is looking for a highly motivated self-starter with management experience to fill the position of full-time Grange Manager. The Grange Manager is responsible for the overall operations of the Grange and leads the WGH board and its committees in creating, promoting and running our high-quality, year-round programming. She/he helps foster a culture that maintains the highest standards in customer service, visitor experience, and quality in operations and in the facility itself. We are looking for someone who is excited by and committed to carrying out the mission of the Grange and will help us move forward into the next decade of this community project. The ideal candidate will have strong administrative skills, creativity and strategic thinking and the desire and ability to interact effectively with others. As the sole employee, the ability to independently assess problems and initiate successful solutions is very important. We are seeking someone with excellent skills in managing multiple tasks and deadlines, prioritization, and time management as well as budgeting. Experience in grant-writing and fund-raising is also desired. The ability to work with frequent interruptions and a sense of humor are needed. The Manager is responsible for outreach and marketing of Grange-sponsored events and the Grange as a whole, including copywriting, collaborating with graphic designers and printers, and digital marketing (emails, website updating). S/he is also responsible for organizing and recruiting volunteers. S/he will build and expand existing relationships with local businesses, organizations, agencies and area residents to develop collaborative partnerships and manage rentals of the building. The Grange Manager position requires some flexibility in work hours to include weekends and evenings as needed. Strong computer skills in basic Microsoft Office programs and Google Drive are required. Comfort with technology and with duties that can vary from introducing performers to cleaning bathrooms are necessary. A detailed job description is AVAILABLE HERE. Mountain Lakes PBS video about the Grange restoration from "Mountain Lakes Journal". January 2013 interview with Mary-Nell Bockman, Program Manager, on North Country Public Radio.